Asahi Optical Co, Ltd. is pleased to announce the introduction of the SMC Pentax-FA Zoom 28mm~90mm F3.5~F5.6 lens for use with Pentax 35mm-format autofocus SLR cameras. 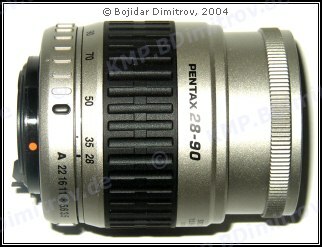 Covering the most frequently used focal length range from 28mm wide angle to 90mm telephoto this standard zoom lens is the most compact in its category, despite its high-performance optical design incorporating 10 elements in eight groups. This versatile zoom lens also features a minimum focusing distance of 40 centimeters (1.3 feet) at any focal length for a maximum magnification of 0.28 times (at the 90mm setting). With its extra-compact, lightweight body, simple operations and attractive styling, this standard zoom lens is the perfect choice for beginning and intermediate SLR photographers using super-compact Pentax MZ-series SLRs.